Philadelphia Phillies former pitcher Roy Halladay acknowledges the crowd before the game against the New York Mets at Citizens Bank Park. Roy Halladay will always have a special place in the hearts of Phillies fans. And, later this year, he'll also have a permanent home at Citizens Bank Park, alongside the organization's other all-time greats, right where he belongs. On Tuesday, the Phillies announced that Halladay, who tragically passed away at the age of 40 after his small plane crashed into the Gulf of Mexico in November, will be posthumously inducted into the Phillies Wall of Fame on Saturday, August 4, prior to the team's 7:05 game against the Miami Marlins. “This will be a very emotional evening as we not only honor the memory of Roy Halladay, but also pay tribute to his extraordinary accomplishments on the mound as he becomes the 39th inductee of the Phillies Wall of Fame,” said David Buck, Phillies Executive Vice President. The Phillies will also fly a No. 34 flag at CBP throughout the 2018 season as a tribute to the late former Cy Young winner. 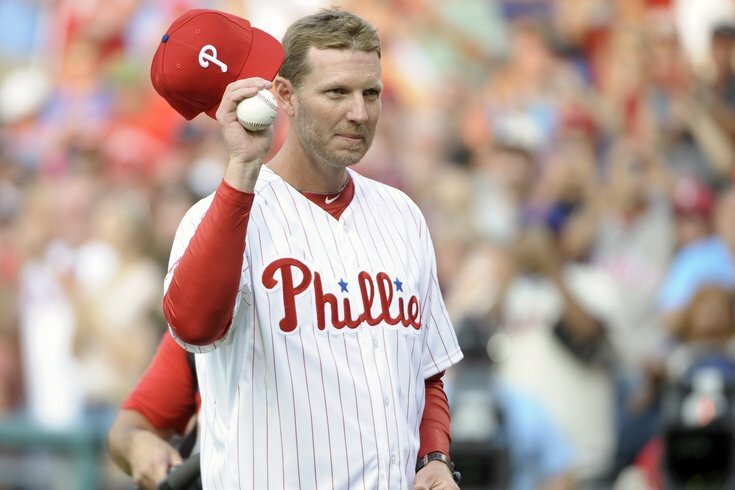 Halladay is one of just four people to make the Wall of Fame, which according to the team "is one of the highest honors bestowed upon a Phillie," without needing a fan vote. The others are Charlie Manuel, Mike Schmidt and Steve Carlton. · On May 29, 2010, Halladay pitched the 20th perfect game in MLB history, as the Phillies beat the Florida Marlins, 1-0. It was the second perfect game in Phillies history (Jim Bunning – 6/21/64). · On October 6, 2010, in his first postseason start, Halladay threw the second no-hitter in MLB postseason history against the Cincinnati Reds in Game 1 of the NLDS. Halladay is the only pitcher who has tossed a regular-season no-hitter and a postseason no-hitter in the same year. Halladay won't be going in alone. The team also announced that they will begin honoring executives on their Wall of Fame, and the first will be former GM and president (and current senior adviser) Pat Gillick. Gillick, who was inducted into the Baseball Hall of Fame in 2011 and played a major role in the Phillies winning the 2008 World Series, is currently in his 13th year with the team.